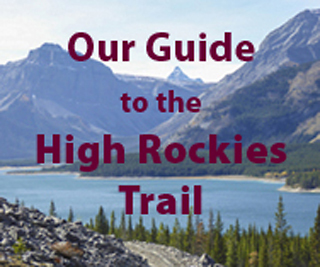 Gillean’s Kananaskis Country Trail Guide Vol 2 is finally making its way into the stores, at least into the independent book stores. In Calgary it is available from Pages and Owl’s Nest and in Canmore at Café Books. Indigo stores have the books on order, but although they have been shipped to the Indigo warehouse in Ottawa, they haven’t arrived in Calgary stores yet. Similar story with MEC. Is Volume 4 The Sheep out yet? If so, where? Bought it! Love it! Can’t wait to use it! I own both of the 3rd edition volumes and absolutely love them. I love the history you include with the trails descriptions. I can’t wait to see the new books. Volume 4 The Sheep is due in spring 2012 if not before. Volume 5 The Highwood is due in Spring of 2013. Volume 3 (Ghost, Bow Valley, Canmore and Spray) will likely be last because of the constant trail building going on in the valley. P.S. – When are the remainder of the columes due out? I just got my copy at The Second Story in Canmore. Lots in stock there and the red of the cover is right in your face as you walk into the store. Thanks to the long weekend I’ll scope out some new areas tomorrow. We were the first ones to buy the new edition at Cafe Books in Canmore yesterday. It looks great! The colour photos are a nice improvement, and the maps are easier to read. I am heartily glad to hear this.